Manufactured in the European Union comes Pharaohs Elite, a new and improved version of the quick lighting charcoal brand. Pharaohs Elite's new formula allows for the charcoal to light faster as well as maintain a more even and consistent burn throughout, making it the most sought after Golden style quick lighting charcoal brand available. 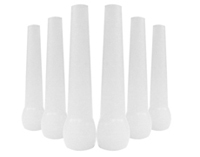 Pharaohs Elite is both odorless and tasteless, making for a more enjoyable smoking experience. Discover the difference with Pharaohs Elite, your new source for Golden style charcoal. It is recommended that three rolls of Pharaohs Elite Charcoals be purchased for every 250g container of flavored tobacco. 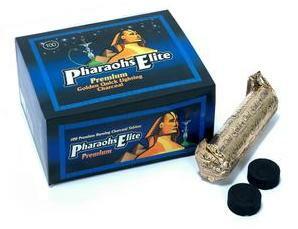 Each roll of Pharaohs Elite Golden Style Charcoal contains ten individual charcoals.